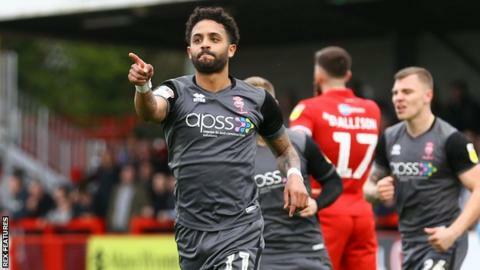 League Two leaders Lincoln took another step towards automatic promotion with a comfortable victory at Crawley. The Imps extended their unbeaten run to 16 games with goals from Bruno Andrade, Shay McCartan and Cian Bolger. Lincoln boss Danny Cowley had billed the game as "the toughest of the season" and the Imps started well with top-scorer John Akinde going close early on. Former Crawley striker Akinde was off target from six yards following a cross by Harry Toffolo. The Reds, with only two wins from their previous 12 games, threatened when Reece Grego-Cox released Lewis Young and his cross narrowly eluded Ollie Palmer. The Imps should have increased their advantage when Danny Rowe headed a Harry Anderson cross over 14 minutes after the interval. Crawley, thrashed 6-1 at Crewe the previous week, had a rare chance when Panutche Camara shot just over after being set up by Palmer. But Anderson blazed over before substitute McCartan made it 2-0 in the 76th minute by slotting home from inside the area after an assist by Tom Pett. The Imps sealed their victory five minutes from time when defender Bolger headed in a corner from Pett for his first goal for Lincoln. Match ends, Crawley Town 0, Lincoln City 3. Second Half ends, Crawley Town 0, Lincoln City 3. Attempt saved. Joe McNerney (Crawley Town) header from the left side of the six yard box is saved in the bottom left corner. Foul by Jordan Roberts (Lincoln City). Reece Grego-Cox (Crawley Town) wins a free kick in the defensive half. Substitution, Lincoln City. Jordan Roberts replaces Bruno Andrade. Goal! Crawley Town 0, Lincoln City 3. Cian Bolger (Lincoln City) header from the right side of the six yard box to the top right corner. Assisted by Tom Pett. Corner, Lincoln City. Conceded by Dominic Poleon. Substitution, Crawley Town. Ricardo German replaces Ollie Palmer. Harry Anderson (Lincoln City) wins a free kick on the right wing. Foul by Reece Grego-Cox (Crawley Town). Substitution, Crawley Town. Dominic Poleon replaces Matty Willock. Goal! Crawley Town 0, Lincoln City 2. Shay McCartan (Lincoln City) right footed shot from the centre of the box to the bottom right corner. Attempt missed. Panutche Camara (Crawley Town) right footed shot from the right side of the box is just a bit too high. Substitution, Lincoln City. Shay McCartan replaces Danny Rowe. Tom Dallison (Crawley Town) wins a free kick in the defensive half. Attempt saved. Cian Bolger (Lincoln City) header from the centre of the box is saved in the centre of the goal. Corner, Lincoln City. Conceded by Lewis Young. Attempt blocked. Panutche Camara (Crawley Town) right footed shot from the centre of the box is blocked. Foul by David Sesay (Crawley Town). Second Half begins Crawley Town 0, Lincoln City 1. First Half ends, Crawley Town 0, Lincoln City 1. Corner, Lincoln City. Conceded by Tom Dallison. Tom Pett (Lincoln City) wins a free kick in the attacking half. Attempt saved. Ollie Palmer (Crawley Town) left footed shot from the left side of the box is saved in the centre of the goal. Dannie Bulman (Crawley Town) wins a free kick in the attacking half. Tom Dallison (Crawley Town) is shown the yellow card for a bad foul. John Akinde (Lincoln City) wins a free kick in the defensive half. Goal! Crawley Town 0, Lincoln City 1. Bruno Andrade (Lincoln City) right footed shot from the centre of the box to the centre of the goal. Assisted by Neal Eardley. Corner, Crawley Town. Conceded by Michael Bostwick. (Crawley Town) wins a free kick in the attacking half.